AN ACT OF CONSECRATION TO THE HOLY FAMILY. To be recited by Christian families who consecrate themselves to the Holy Family. "O Jesus, our most loving Saviour! Thou Who wast sent down from Heaven to enlighten the world by Thy teaching and example, and Who didst will to pass the greater part of Thy holy life in lowliness at Thy home in Nazareth, subject to Mary and Joseph, and thereby didst hallow the household which was to be the pattern for all Christian families, do Thou in Thy goodness receive our household which this day consecrates itself to Thee. Protect and guard us, strengthen us in Thy holy fear, establish in our hearts the peace and concord of Christian Charity, so that each one of us becoming like to the divine model of Thy family, may be sharers of eternal joy." "O Mary, most loving Mother of Jesus Christ, our Mother, through thy love and mercy intercede, that Jesus receive this act of Consecration, and pour out upon us His graces and blessings." "O Joseph, most holy Guardian of Jesus and Mary, help us by thy prayers in all our necessities, both of body and soul; that together with the Blessed Virgin Mary and thyself we shall praise and thank Jesus Christ, our Divine Redeemer." A Prayer To Be Said Every Day Before A Picture Of The Holy Family. O most loving Jesus, who didst hallow by Thy surpassing virtues and the example of Thy home life, the household Thou didst choose to live in whilst upon earth, mercifully look down upon this family, whose members humbly prostrate before Thee, implore Thy protection. Remember that we are Thine, bound and consecrated to Thee by a special devotion. Protect us in our necessities and impart to us strength to persevere always in the imitation of Thy Holy Family so that by serving Thee and loving Thee faithfully during this mortal life, we may at length give Thee eternal praise in Heaven. 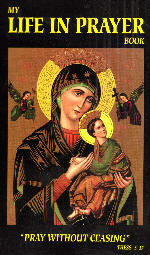 O Mary, dearest Mother, we implore thy assistance, knowing that thy Divine Son will hearken to thy petitions. And do thou, most glorious Patriarch, St. Joseph, help us with thy powerful patronage, and place our petitions in Mary's hands, that she may offer them to Jesus Christ."